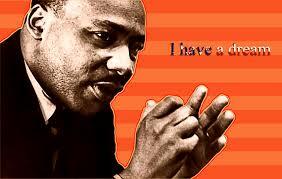 Happy 50th anniversary to the iconic Martin Luther King Jr.’s “I Have a Dream” speech. May we increasingly make the dream our reality. The full text of MLK’s speech, from the National Archives. * nb. It is not particularly ‘Buddhist‘, or ‘Spiritual‘ to stand aside when injustice is done. Like MLK says, anger isn’t best. Forget the resentment; by holding a controlled mind we have a powerful weapon. Mentally stepping back from the situation gives us emotional space. Allows us the power we need. Then just standing for justice promotes it; and those who are oppressed have a valuable friend. (times by however many stand by them). “If we are one consciousness, then anybody else’s injustice, becomes our injustice! Conversely, if we do stand aside and look the other way, then evil will flourish; because good men have done nothing. …and everyday we are overcoming more. Yes, we do need them, you’re right. Have people given up hope for human heroes? Is that why so many are looking towards space for alien intervention? * That’s maybe a hypothetical question, BTW. Everyone wants a hero, but it seems that very few are prepared to be The One to stand up and BE that hero… or maybe we are just looking in the wrong places?